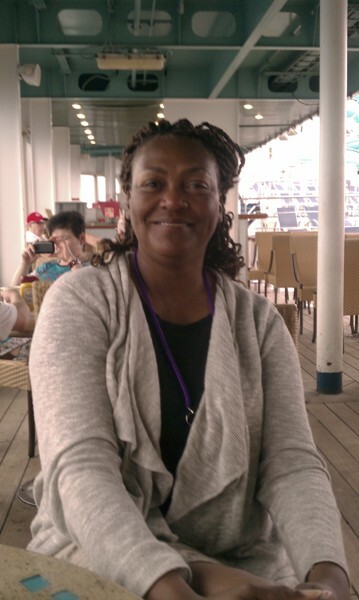 This is a Blog Series on the Women of Destiny Conference, Cruise to the Bahamas which will continue through this week. Click here for Blog Series Part 3 – Ship Destiny. When my husband Ray decided over 25 years ago that he wanted to serve in the U.S. Navy, after he signed on that dotted line, he had to first go through intense physical and mental training at boot camp before he became a specialty combat medic in the Marines. In boot camp you follow orders or find yourself wishing you had! It’s vital that you follow instructions in boot camp because in a real combat situation, if you don’t, you may be killed or someone else in your unit may be. It endangers everyone for you to take matters into your own hands. When God gives His marching orders, we need to obey, too. I was saved at 18 years old, and then went through a period of rebellion in my 20’s that caused me irreversible consequences, pain, and deep regret. Thank God for His mercy and forgiveness! When I was 32, I rededicated my life to Jesus Christ and began passionately pursuing Him and God’s word in my life. In 1989, God called me to ministry, giving me my life scripture of Isaiah 61 for my calling. Several years ago, God put a desire in my heart to travel all over the world, both for short-term missions with my family and for pleasure. My husband Ray has been to Haiti five times, Mexico, Israel, and other places for God. Our daughter Heather attended and graduated from YWAM, and went on mission trips to Brazil, Peru, Columbia, India, Nashville after the flood, Joplin after the tornado, and other stateside mission trips. I went with Ray on his third mission trip to Haiti, and have been to Israel and Joplin, MO, after the tornado, for mission trips. A short-term mission trip to Africa is on my heart now. I’ve been praying about going to Africa for years. Years ago, I told God that I’d go wherever He wanted to send me and I would give Him all the glory. But the Bahamas had never even occurred to me. It wasn’t on my bucket list! When Tony invited me to speak at the Women of Destiny conference, and God spoke to me to go, there were several things I had to do first. One was making sure our daughter Leah would be taken care of while I was gone, especially if Ray was going with me. She is 17 years old, but I couldn’t just leave her at home alone for a week! As I shared in yesterday’s post, we also needed God to provide the finances before I was able to go ~ and God showed up! 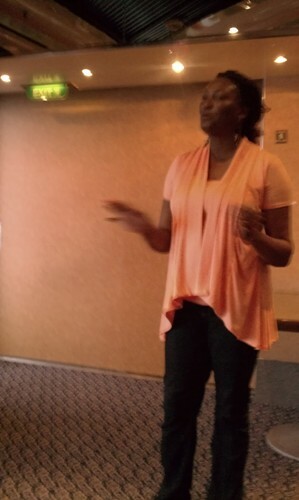 One of the most important things I had to do before going on the cruise was preparing to speak. Sometimes people are under the impression that public speakers charge a fee for just the 45-minute to an hour speaking time. But a lot goes into that presentation beforehand: prayer to hear God’s still, small voice for His specific word for that specific audience, hours of study and research in the Bible and other resources, writing or typing out notes (or preparing a power point), gathering visual aids if they’re to be used during the presentation, and practicing the presentation so that you know it and aren’t a bumbling fool in front of everyone when it’s time to speak! Most of all, I pray for God’s anointing on me because without that, it will just fall flat and won’t bear any fruit! After all that I’d been through to get to the conference on the ship, I was exhausted, yet pumped up because I knew this had to be good! 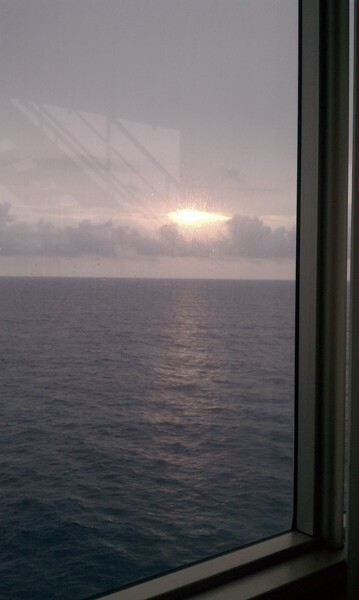 I was nervous the first day being on the ship, battling the fears I’d had, especially about getting seasickness. Praise God, I didn’t get nauseous or seasick the entire cruise! This is a HUGE praise report! Thank you so much for your prayers! On Monday night, we had a short Meet and Greet meeting with the ladies attending the conference. 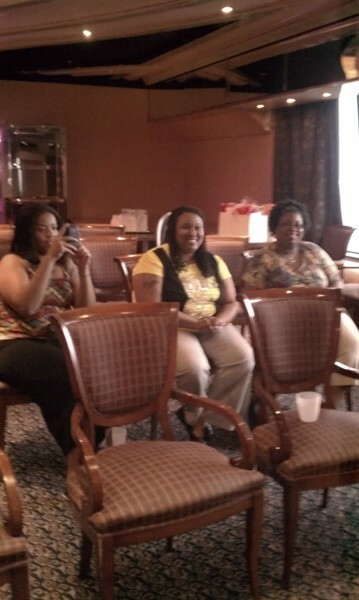 Everyone was excited to be on the cruise and about the conference. Tony was fired up and I couldn’t wait to hear her preach! After dinner in the formal dining room on Monday night, I went to bed and slept better than I had in months. Throughout the cruise, I never had insomnia or problems sleeping, which I usually do. (My friend Diane calls it “entrepreneurial ADD). 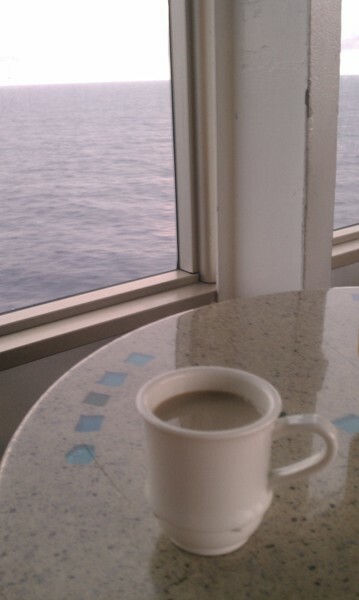 As my sweet friend Shelley had told me, I slept like a baby on the ship, with God rocking me to sleep with the waves. Tony Robinson had planned sunrise prayer for Tuesday morning to set the tone for the conference. She had told all of us at the Meet and Greet meeting on Monday night that she would probably be hugging her pillow and wouldn’t make the prayer time. I am NOT a morning person and the thought of intentionally getting up early is NOT appealing at all to me! Since our husbands weren’t able to come this time, Tony and I were roommates during the cruise. I heard her getting up at the crack of dawn and decided that I better go, too, since I would be speaking that morning! Dear friend, it was so worth it! Looking at that sunrise over the ocean that Tuesday morning, my eyes filled with tears and my heart overflowed with joy and anticipation of what God was going to do. I couldn’t believe that He had sent me here! I certainly didn’t deserve this blessing, but God is just so good and full of grace! Tony and I enjoyed having “coffee with God.” Maybe this is something you can begin to do each morning ~ setting a little time each morning to drink your coffee, hot tea, or cold drink, to pray and read from the Bible or from a daily devotional, like the powerful, little one I’m reading now by Sarah Young, Jesus Calling ~ just spending some quiet time with God before your day starts. If your mornings are too busy and hectic, then you can “Take Five” with God at lunch, in the afternoon, or even have night time devotions. God doesn’t care when you spend time with Him. You don’t have to spend hours a day with Him, either. He’s always there for you and He just wants to be with you! After Tony and I talked a few minutes and then prayed, she suddenly said, “I just felt the wind of the Holy Spirit blow through this place!” I told her I’d felt it, too, She turned around and began speaking to the man at the next table (who we did not know). This man on the deck had just purchased WiFi time on the internet, and told Tony, “Just a minute.” We sat there, waiting on God, and then the man actually came over to our table and stood there, talking with us! Everyone needs to be lifted up with positive, encouraging words sometimes! Tony invited him to our meeting that morning at 9 a.m. (even though it was a women’s conference!). He didn’t come, but we do know that we planted seeds of eternity into his heart that morning and we were filled with joy! A divine appointment! Tony and I went to get ready for our meeting, and then she had more divine appointments in the laundry room and invited the women believers there to our meeting! Meanwhile, I got ready and set up the room. I.e., I asked the Carnival Destiny staff person to crank up the air conditioning in the meeting room because I get hot easily! The sweet staff woman helping us also found a music stand for me to put my notes on, and I used a little table for my visual aids and gift bags. Carnival Destiny’s staff had given us this beautiful room with the big window view of the ocean, and set up chairs and glasses of ice water for us. The staff is just awesome! I had several books to give away as gifts to the attendees: Sandy Krakowski’s book Read Their Mind: How to Hear What the Marketplace Wants and Build A Huge Business, Katie Brazelton’s book Pathway To Purpose for Women, and my book The Hands Of A Woman. What do you have to give away to others that will bless them? Tony had been led by God to ask one of the attendees, Donnisha Russell, if she could sing and would she lead worship that morning. Donnisha’s face broke out into a wide smile, and she said yes. She has a beautiful voice, which you can hear a little of as she sings “Friend of God” in this video by clicking here. You see, only God had told Tony that Donnisha sings! That is the kind of God we serve! Genesis 1:1-2: “In the beginning God created the heavens and the earth. 2 Now the earth was formless and empty, darkness was over the surface of the deep, and the Spirit of God was hovering over the waters.” God was hovering over the people on the ship and the waters as we traveled, just as He hovered over the waters in the beginning of time. God wanted to touch not only the women at the conference, but all those on the Carnival Destiny cruise ship with His Holy Presence! This is something God spoke to Tony and me both before the conference. My favorite scripture, Psalm 42:7: “Deep calls unto deep at the noise of your waterfalls: all your waves and your billows are gone over me.” Deep calls unto deep – God wanted to speak to us the deep things of God during the conference by His Holy Spirit – through prayer, worship, and studying His word. Only the Spirit of God understands the thoughts of God; the natural man doesn’t understand or accept them. Satan will try to hinder or stop you from achieving your great destiny through fears, distractions, stress, strife, discouragement, getting you to just give up and quit, not using your spiritual gifts, spiritual apathy and laziness, and many other strategic tactics….but God is greater. Your destiny is inevitable, with faith and trust in God. Keep pressing on and running the race to the finish line! 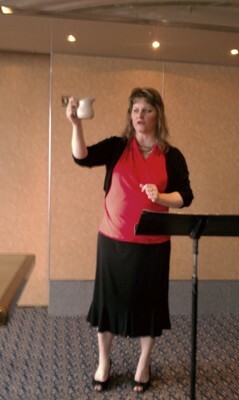 I had so much fun giving away the gifts at the conference. Here I am with Carlette Jackson. Carlette is such a friendly woman and she is absolutely HILARIOUS. She shared lots of helpful tips with me about the cruise. She also had all of us in stitches laughing one night at dinner, telling us how she lets her kids know they WILL behave in her house. Another winner was Ana Muniz. Ana was so sweet. 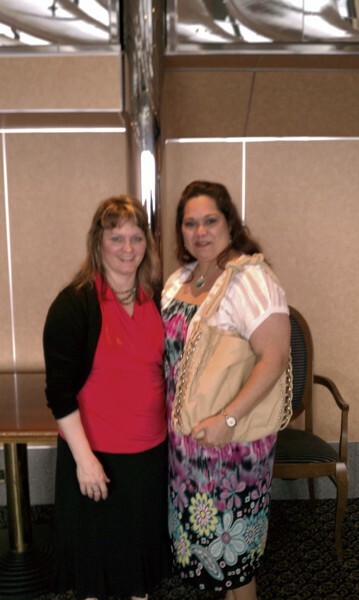 She has been blessed with a lot of children and as she told me, “All my children are good children.” 🙂 She and her daughter Enid came together on the cruise to the conference, which I thought was awesome. It was Ana’s Mother’s Day gift! 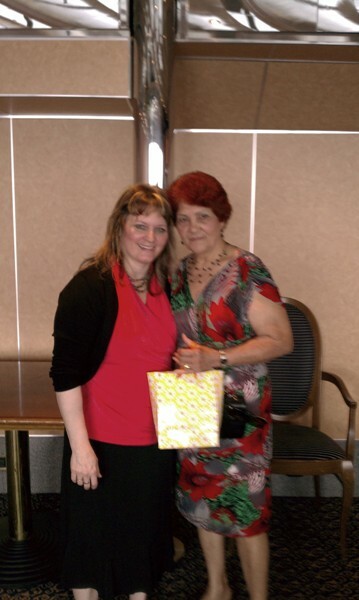 The pic below is of Ana’s beautiful daughter Enid, who has a heart for Mexican women to pursue the things of God. 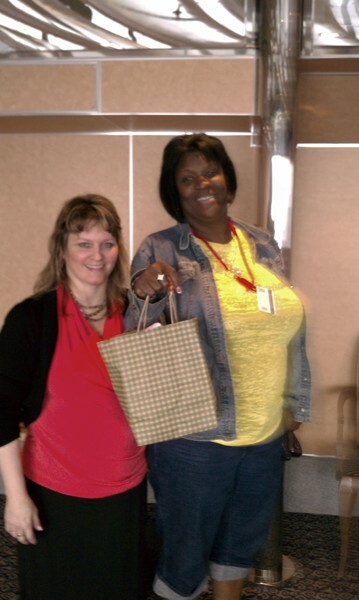 The third winner was LaToya Gay. 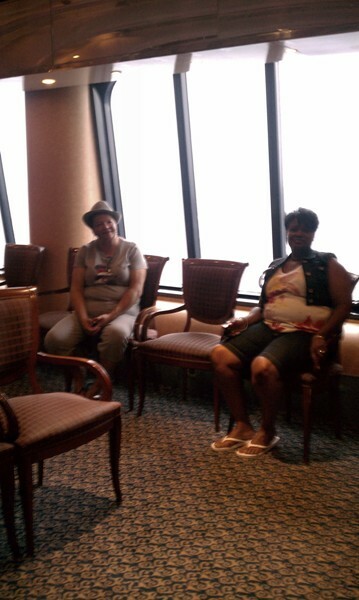 I was friends with LaToya on Facebook prior to the cruise, but like with Tony, I’d never met her in person. I was so happy to finally meet her in real life! We hit it right off . She, Tony and I talked a long time one night on the top deck. (And LaToya was afraid of heights, but she went up there!). She and these other women of God are mighty women of God! 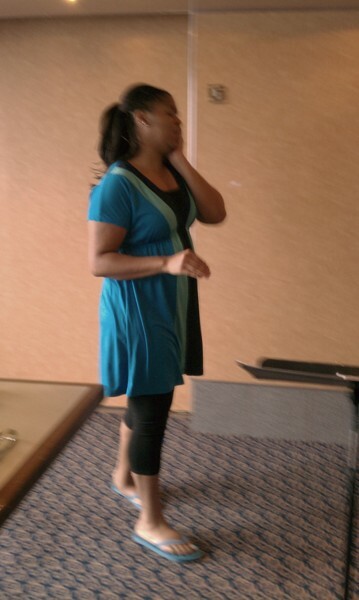 LaToya is a powerful worship leader. I had no idea that she had that kind of voice! LaToya bought my book The Hands Of A Woman, and in the pic below I am sharing words of encouragement with her as I’m signing my book for her, about her being a warrior like Deborah (book of Judges). If you are not already on Facebook and Twitter (and Pinterest) to make new friends and to network, I encourage you to do so. You will have divine connections like these! Other awesome women at this conference were Founder and President Delonda Adams of Proverbs 31 Mama Ministries, and Carol Patterson, who personally blessed me with her generosity and instant friendship. Tony spoke powerful words of destiny into these ladies’ and the other attendees’ lives. My favorite women at this conference were Well Watered Woman Ministry leader Tony Robinson, her powerful intercessor Kim Hudson, and Tony’s conference M.C. Angela Hardy. These are beautiful, anointed, incredible women and I loved them and the women at this conference instantly! I hope we all stay connected and are friends for life! Since Tony and I were roommates throughout the cruise, we had an opportunity to talk privately some. She is a powerhouse for God. 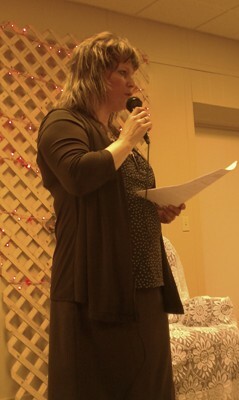 I loved watching her preach and teach. She walks her talk. She’s a wonderful person, a woman of faith in God and she walks in peace, no matter what circumstances say. Tony has a huge heart of giving and love, and is very prophetic. (She will read your mail!) She is inspiring as a wife and a mother. Kim is Tony’s ministry intercessor. She’s God’s battleax in prayer. 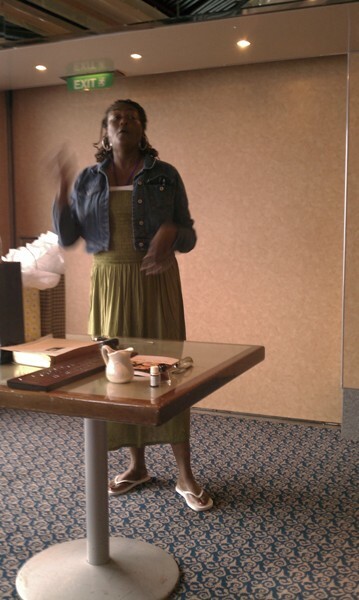 (Jeremiah 51:20) Kim personally ministered to me one night on the cruise. She came to check on me just to see if I was doing okay, and she prayed for me and blessed me so much, sharing words that uplifted me and gave me great hope. I loved watching her in action at the conference as she prayed over the meetings, prayed for Tony, and prayed over the women. Kim also had been “praying it through” for me to get to the conference. I attribute Tony’s, Kim’s, and Tony’s team members’ prayers with the victory! What is incredible is that even though Kim had never met me before, God gave her a prophetic dream of me speaking at the conference. When my plane flight was cancelled the day I was leaving for the cruise, Kim reassured Tony I WOULD be there, speaking at the conference because God had given her that dream. I love how God works! Kim is married to a man who is a great man, a man after God’s own heart like King David and is a spiritual father like Abraham. I believe that one day he and Tony’s husband Reggie will meet Ray, and they will all hit it off great! Divine appointments! I felt like beautiful Angela was my black twin sister, LOL. She and I have been through similar painful things. She is ON FIRE for God! The MOMENT she takes the mic, the anointing is INSTANT. I wanted to hear her preach so bad! Next time, Angela! Angela and I spent some together on the deck just sharing our hearts with each other. 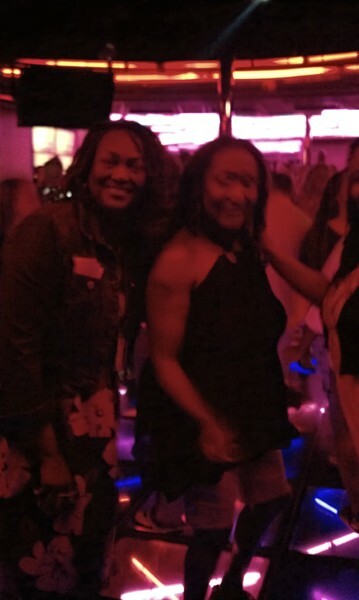 Below is a picture of Angela with another Women of Destiny conference attendee and mighty Deborah warrior, Deborah Caldwell. Deborah is a serial cruiser, having taken many other cruises before this one. 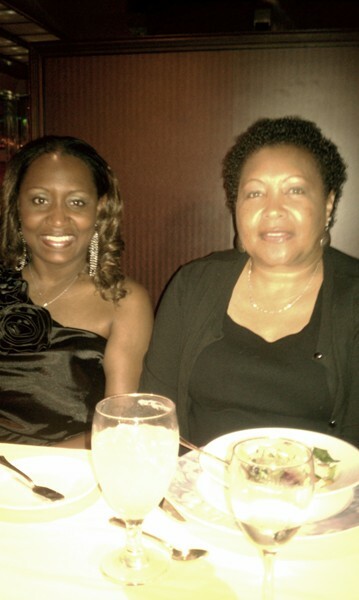 She and Carlette Jackson gave me great tips about cruises. Deborah bought my book and personally encouraged me that God had indeed sent me there to the conference to speak words of truth. After I spoke, Tony prayed over the women attending the conference including me, and she really encouraged me. That first meeting ignited our hearts with anticipation for the rest of the conference. We relaxed the rest of the day ~ eating, resting on the deck, swimming, just doing whatever we wanted. After I experienced all the bad-singing karaoke that I could stomach for awhile, I went down to my cabin room for a few minutes and Tony came downstairs, too. 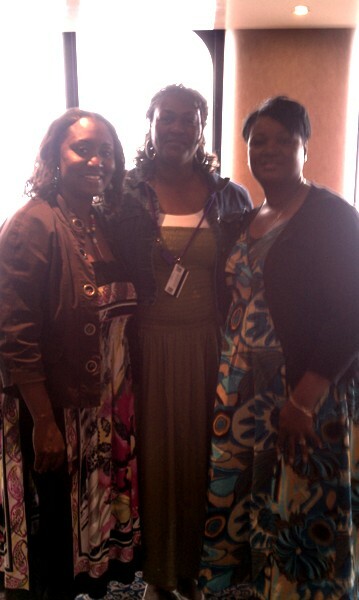 She, Angela, and LaToya were going dancing in the purple room together, and Tony invited me to go with them. I LOVE this pic below of Tony and Angela dancing in the purple room. I crack up laughing whenever I look at it. Angela said every time she starts dancing, she just can’t stop! They know how to DANCE! We were having so much fun! 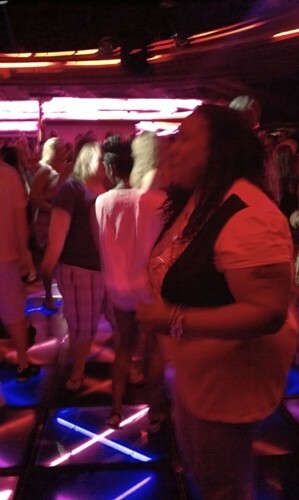 Below is a pic of LaToya dancing. She knows how to dance, too! We had a BLAST! Here is a short video I made today, I Just Gotta’ Dance! I haven’t been dancing in awhile and it was great! Dancing makes me happy! Dancing will set you free. King David danced before God with all his might. In tomorrow’s Blog Series Part 5, I’ll be sharing about visiting Grand Turk, where the water is blue-green, clear as crystal, and just incredible to swim in…and what God spoke to my heart there that will encourage you, too.